Life offers few conveniences that surpass Chinese take out. Strike that—Life offers few conveniences that surpass Chinese delivery. A Shrimp Fried Rice recipe that puts delivery to shame. On a busy weeknight, a carton of so-bad-it’s-good General Tso’s chicken, white sticky rice, and a stack of golden-fried egg rolls starts to sounds pretty fine. Though I love the taste of [insert major Chinese fast food chain here] sesame chicken, lo mein noodles, and crab rangoon on my tongue, I don’t fancy the oily glob it leaves in my tummy. Enter The Law Student’s Wife’s healthy SHRIMP FRIED RICE recipe. Inspired by Chinese fast food, it offers the “I just can’t stop eating this” MSG taste, minus the MSG. 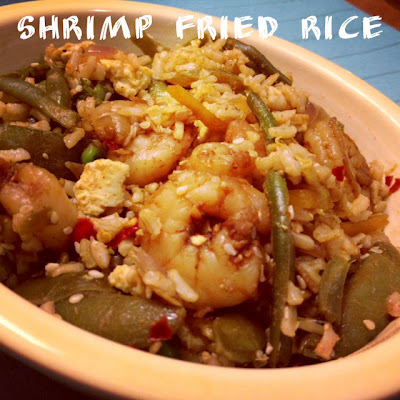 Frozen ingredients cut down on prep time (just thaw them in advance), whole grain brown rice is used in place of white, and this SHRIMP FRIED RICE recipe features far more veggies than you’ll find in your take out carton. It is a quick, healthy meal perfect for busy weeknights. Your wallet will love this healthy SHRIMP FRIED RICE recipe too. Starting with frozen shrimp drops the price to around $2 a serving, making this a truly budget-friendly meal. Last I checked, my egg drop soup wrecked greater monetary havoc. Yank that Chinese delivery menu off your fridge, print this healthy SHRIMP FRIED RICE recipe, and hang it in its place. Your better-than-fast-food-fast-food has arrived! Meanwhile, in a medium bowl, coat shrimp with chili powder, paprika, 1/2 tsp. red pepper flakes, garlic powder, and cayenne. Set aside. Heat olive oil in a large wok or deep skillet. Scramble eggs with a little bit (about 1 T. water) and cook over medium heat. Once cooked, remove eggs from wok, season with black pepper, and set aside. Turn the wok up to medium high. Add 1 T. sesame oil, onion, and garlic. Cook until fragrant, 1-2 minutes. Add vegetables and sauté until hot. Add shrimp and sauté for a few minutes until no longer translucent. Add remaining red pepper flakes, remaining sesame oil, cooked rice, cooked eggs, soy sauce, and fish sauce. Mix well until fully heated through, 2-3 minutes. A spicy note: This recipe packs a moderate kick. I'd award a spicy level 2 on a scale of 1-5, with "1" translating to "Mildly interesting" and "5" meaning "Comes with a jumbo box of tissues and a gallon of milk." If you are of delicate pallet, simply scale back on the red pepper flakes, cayenne, and chili powder. If you prefer your food to "hurt so good," increase the spices instead.